With more than 20 years of experience, Ken Muskat has dedicated his entire professional career to the cruise industry. 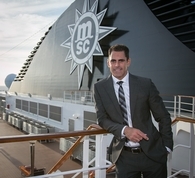 He currently serves as chair of the Trade Relations Committee for the Cruise Line Industry Association and is the executive vice president of sales, PR & guest services for MSC Cruises, one of the fastest growing cruise lines in the industry. Since 2006, Ken has also served on the Board of Directors for the Children’s Cancer Caring Center and in 2013 he was named vice president of the organization. Born and raised in Miami, Florida, and having visited 24 countries and 3 continents, Ken enjoys extensive travels and an active lifestyle full of many friends and an amazing family. He reminds people that it’s important to take it all in, take a photo and enjoy the experience and destination. He can be followed in the Twittersphere @KenMuskat.